Look like a local when out-of-towners come for Commencement by visiting the four corners of D.C.
Family and friends from near and far are sure to come into town for Commencement. Give them a grand tour of the city to round out your four years as a District resident. Forget the monuments, and take them to these D.C. locations in all four quadrants. Rethink traditional sculpture materials with the Renwick Gallery’s current exhibition celebrating modern art. Take advantage of the “photography encouraged” signs by getting creative with the unique artwork. Renovated in 2013, the gallery’s Victorian home is also a national landmark. Enjoy this free museum – open until 5:30 p.m. daily – with friends and family. If younger family members are in town, entertain them at the Smithsonian National Zoo. There are enough animals and activities to fill a whole day of exploring at no cost. Prepare to spend several hours wandering along the elephant trail from the giant panda habitat to the bird house, then down to the giant apes area. You can also find elephants, cheetahs, American bison, donkeys and a flock of peacocks along the way. Six cafes and grills conveniently dot the main path through the zoo, or bring your own food and picnic at one of the many shaded seating areas. Be sure to come in the early afternoon when the animals are most active. Located in a small white building in the quiet neighborhood of Brookland, the Jazz and Cultural Society is the perfect place to chill out and jam out. The society, which will celebrate its first anniversary on May 25, has already played host to many prominent jazz artists, including Lyle Link and Nasar Abadey. The entrance fee is $5 and a local catering company supplies the comfort food. With a staff of volunteers, JACS has a friendly and relaxed vibe. Don’t worry about a dress code – they don’t have one. At JACS, you can enjoy the atmosphere, listen to quality jazz music and just relax. If you love nature and need space to soothe your pre-Commencement jitters, check out the National Bonsai & Penjing Museum, located on the grounds of the National Arboretum. The museum is divided into three pavilions – Chinese, Japanese and North American – and two activity centers. It houses several Bonsai and Penjing exhibits, including the Yamaki Bonsai and the Chinese Banyan. The World Bonsai Day Festival will be taking place at the museum on May 13, 14 and 15, from 9 a.m. to 5 p.m. with free demonstrations and family activities. The museum is open every day from 10 a.m. to 4 p.m. and entry is free. The closest Metro station to the museum is Stadium-Armory, and there is free parking if your family brought a car to town. If you’ve captured enough cherry blossom pictures to last a lifetime, have countless selfies with Lincoln or refuse to take another photo of your siblings “holding” the Washington Monument, head to Southwest D.C. for unique family photo ops. The marinas at the edge the Southwest waterfront along the scenic Anacostia River are much more peaceful than the busy Georgetown waterfront. Be wary of the odors coming from the famous Maine Avenue Fish Market just south of the freeway: Its scent will travel down the length of the wharf. It is the oldest continuously operating fish market in the country and the perfect place to pick up seafood for lunch. For an artsier frame, visit the Blind Whino SW Arts Club for graduation photos that will blow up on Instagram. The non-profit has turned what was once an early 20th century D.C. historic site into a cultural event center, with an exterior that’s a work of art itself. Picture a whimsical combination of Victorian architecture and imaginative abstract color. Blind Whino and Wharf D.C. have produced several murals around the District as part of the #innercityhues project. All the world’s a stage – or at least it is at Folger Shakespeare Library and Theatre. The library is home to the world’s largest Shakespeare collection, according to its website. Since 1932, the neoclassical research library has been about nothing but the Bard, featuring free historical exhibits, weekend tours of its reading rooms and Elizabethan Garden, and performances throughout the year. This season, Folger’s classic Elizabethan theatre will host an adaptation of Shakespeare’s “The Merchant of Venice” ($35-$75) until July. The adaptation by Aaron Posner, retitled “District Merchants,” will reflect the classic tale but take place in an imagined post-Civil War D.C. 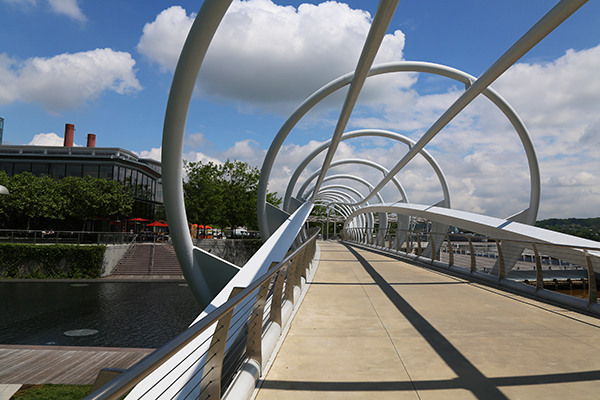 If you’re tired of the same river views at Georgetown’s waterfront, head to Yards Park on the Anacostia River to see gardens, a beautiful canal and a waterfall fountain – just two blocks from the Navy Yard Metro station. Center of the Capitol Riverfront Business Improvement District, Yards Park features several architectural statements, including the canal bridge and 60-foot-tall Light Tower, made of reflecting prisms that shine during the day and illuminate internally at night. With a beautiful entryway fountain and plenty of grassy picnic space, Yards Park is perfect for the whole family.